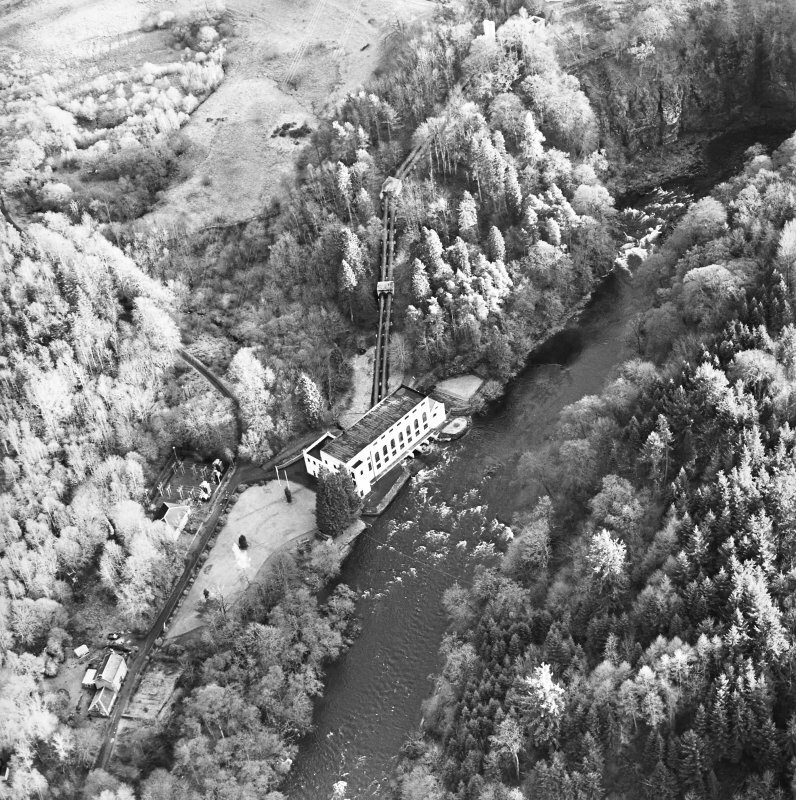 Oblique aerial view centred on Corehouse with power station and pavilion adjacent, taken from the W.
Oblique aerial view centred on Bonnington power station with pavilion adjacent, taken from the NW. 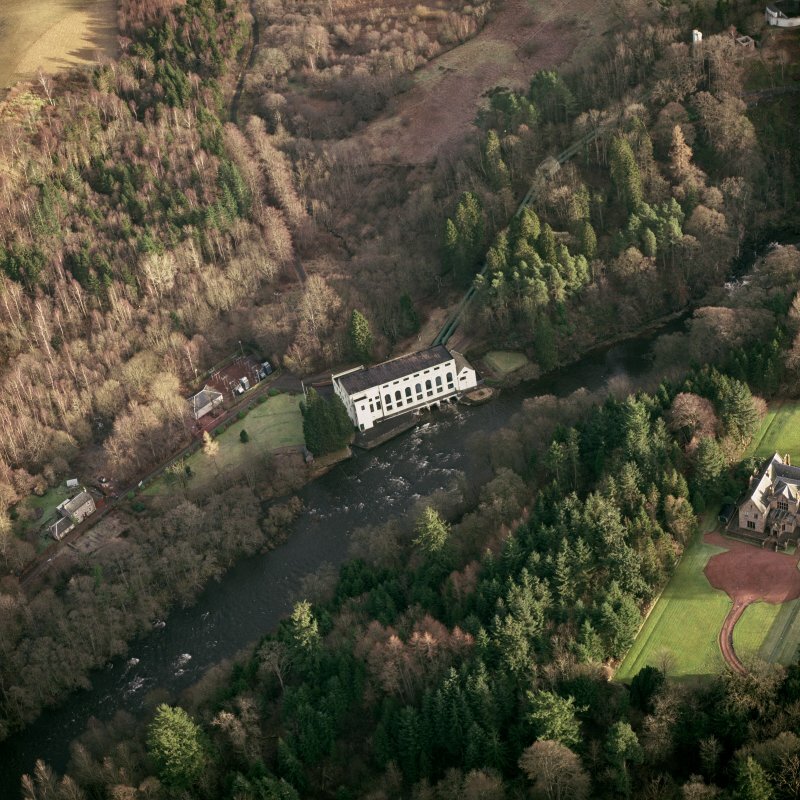 Oblique aerial view centred on Corehouse, the power station and pavilion, taken from the W.
Oblique aerial view centred on Corehouse, the power station and pavilion, taken from the WNW. 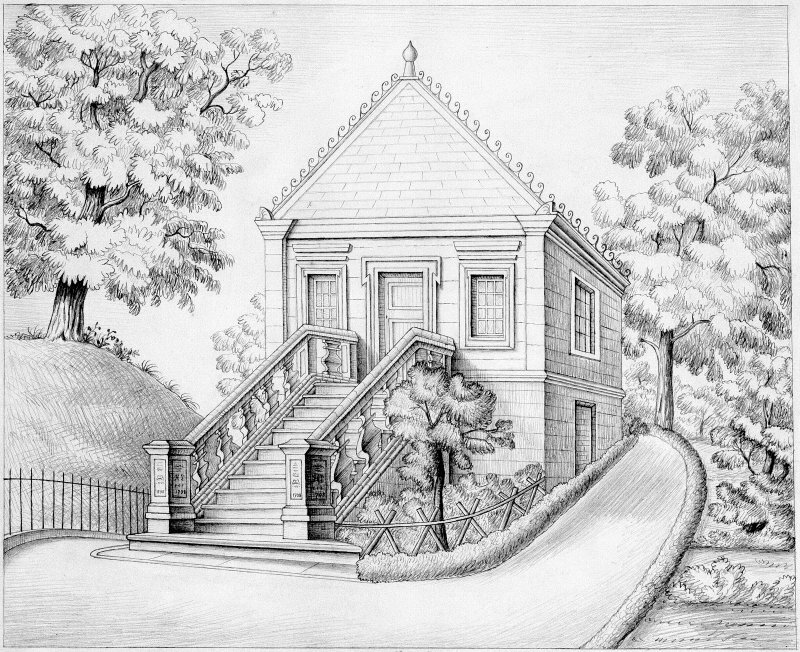 Drawing showing view from South-West. 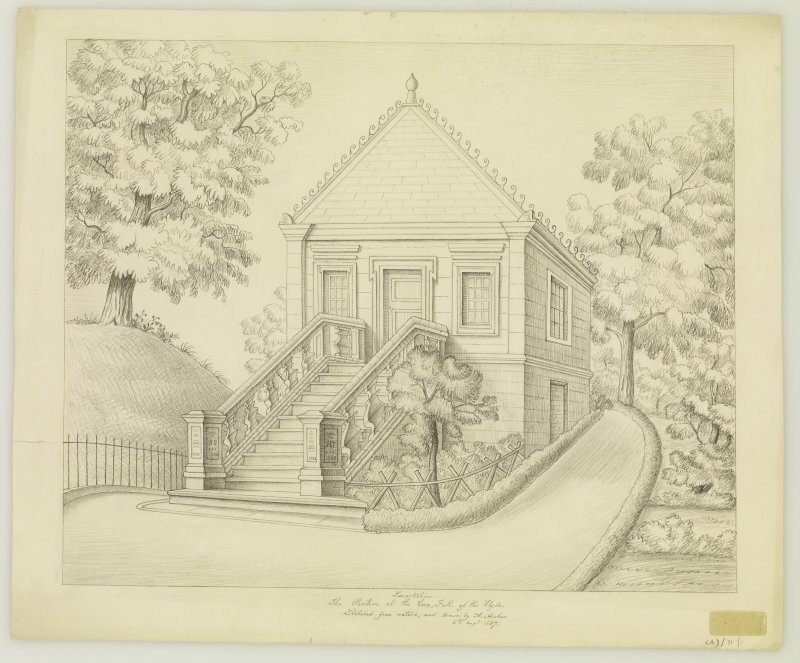 Scanned image of drawing showing view from South-West. 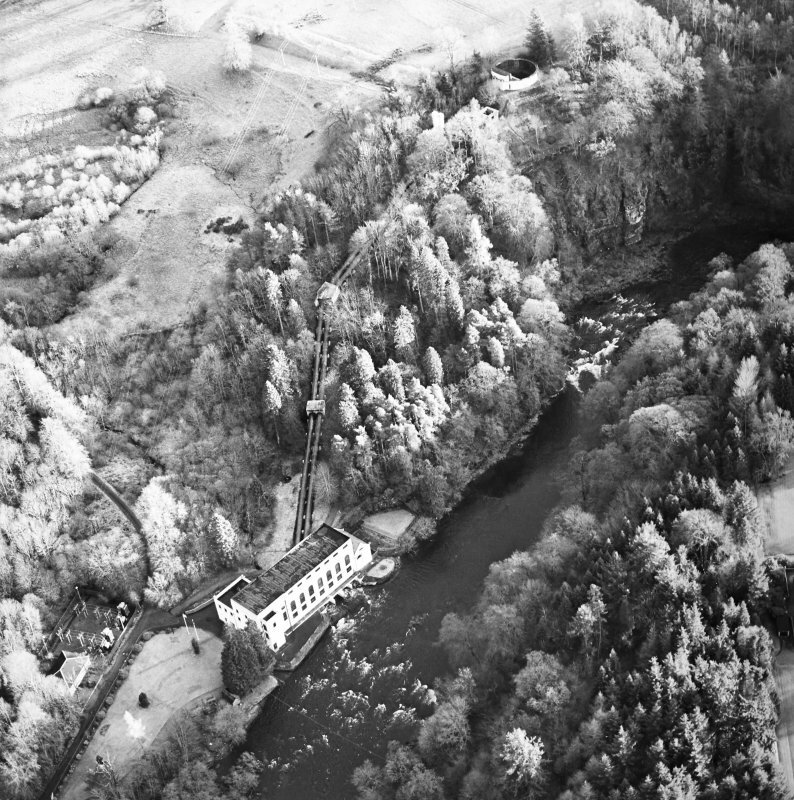 Scanned image of oblique aerial photograph of Bonnington Power Station, taken from the NW. Gazebo overlooking the Falls of Clyde. Ashlar fronted, rusticated quoins, moulded architraves to windows, pyramidal slate roof. 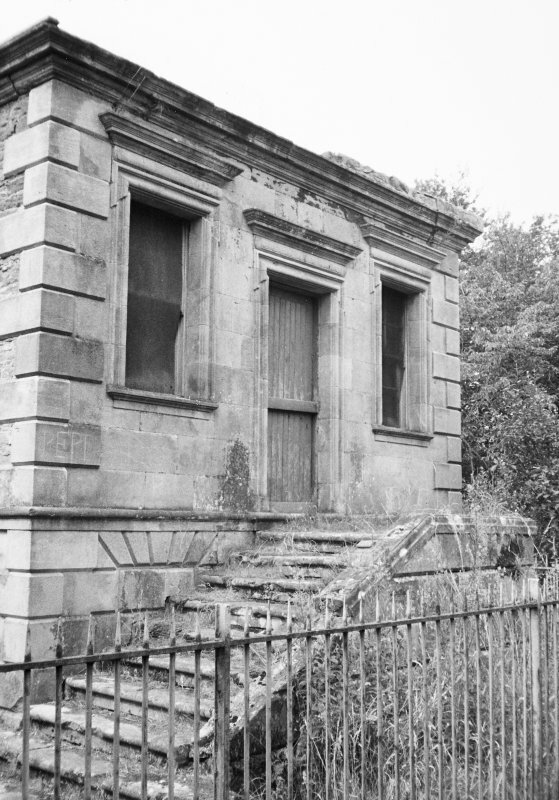 Bonnington House was demolished in the 1950s. 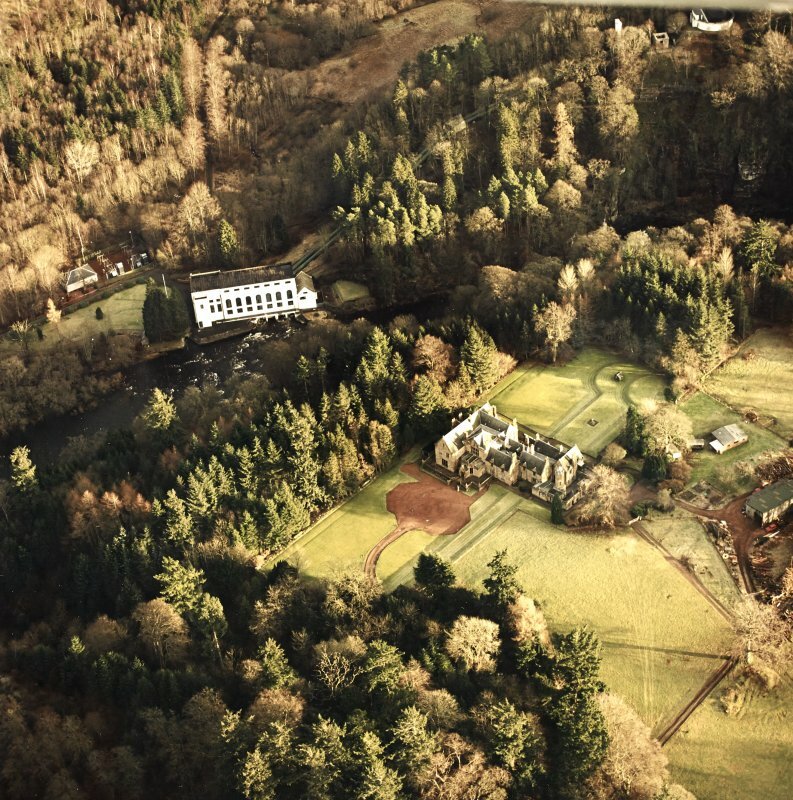 It was designed by Gillespie Graham who also carried out work for Sir Charles and Lady Ross at Balnagowan. 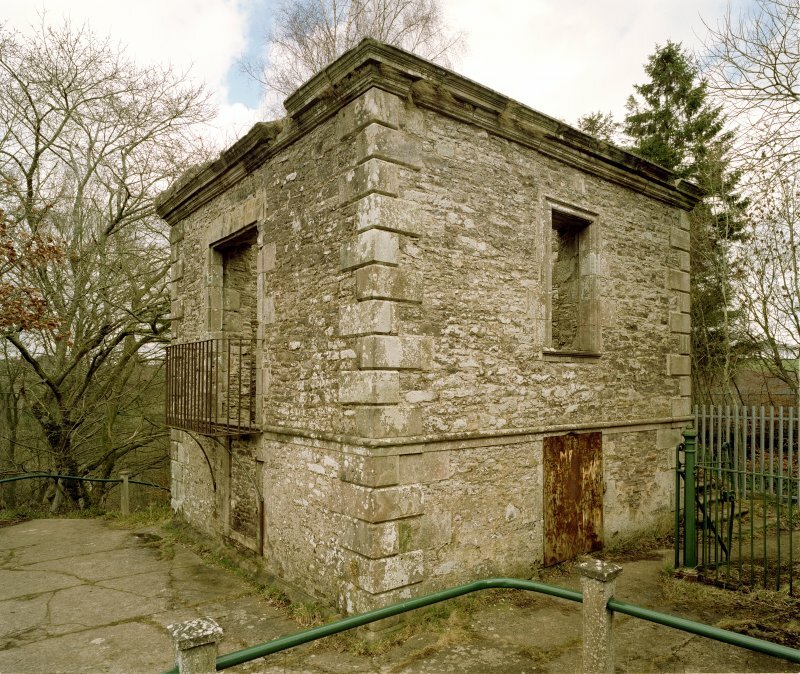 The pavilion at Corra Linn has a complex history. 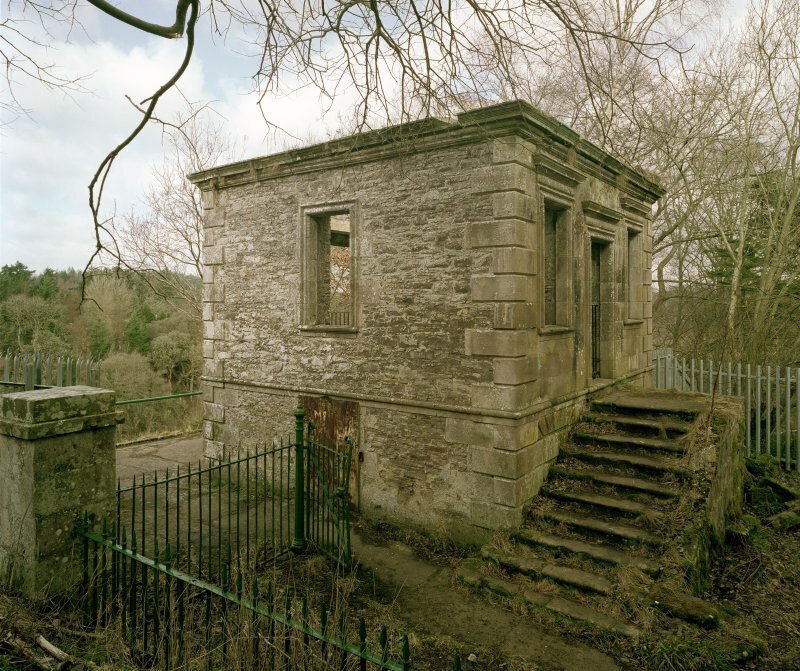 A datestone proclaims its existence from 1708, but it has been much altered. The interior is described in the Ordnance Name Book as being fitted with mirrors. The direction from which the building is approached has also been changed. 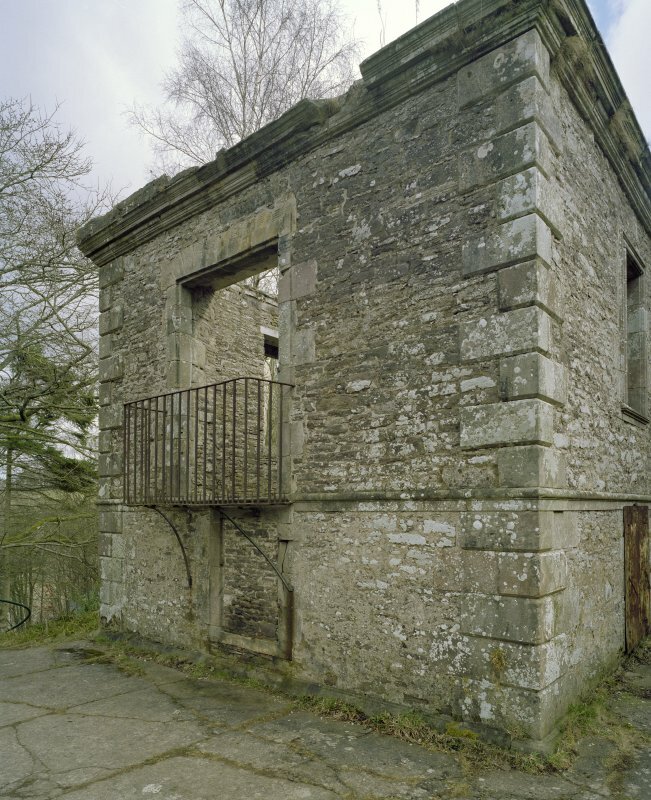 The paths around the view house were added to in the first quarter of the 19th century by Lady Mary Ross, this being recorded by letters cut into one of the steps below the view house 'Designed by Lady Mary Ross A.D. 1829. Lady Mary Ross was the wife of Sir Charles Lockhart-Ross 7th Bt., who had been Lady Mary Fitzgerald daughter of the Duke of Leinster. 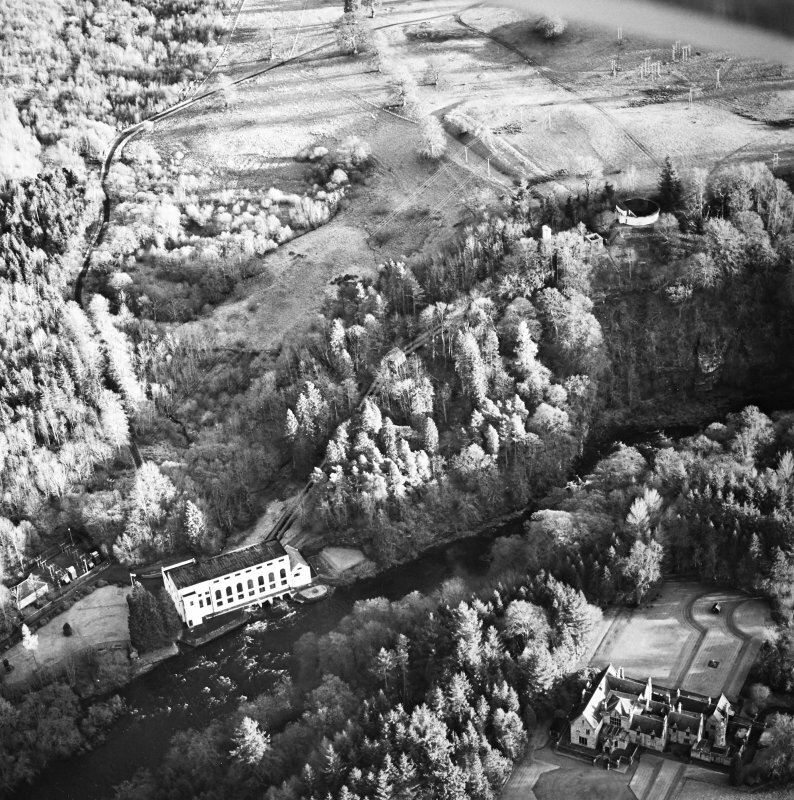 While the Lockhart-Rosses were making improvements at Bonnington similarly, changes were being made to their Highland estate Balnagowan (q.v. 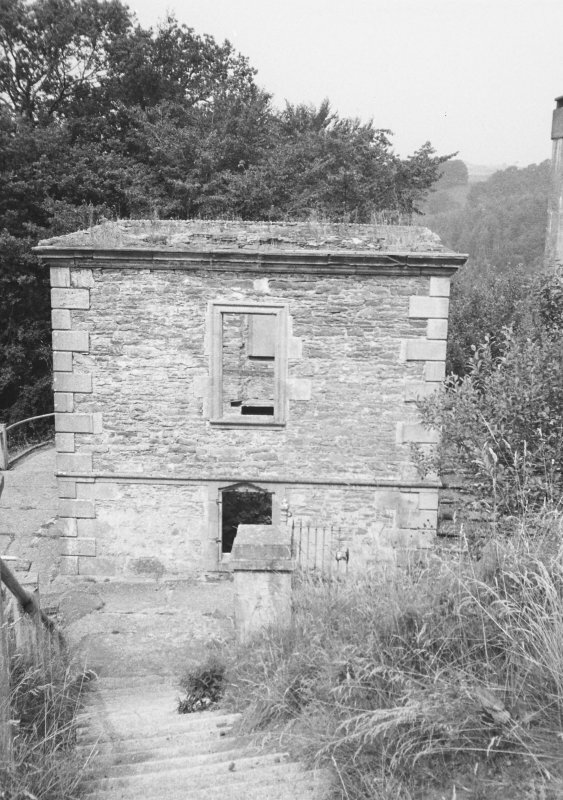 ), where they also had a house overlooking a river. Lady Mary Ross was obviously a keen gardener who improved both estates. There were walks all the way along to Bonnington Linn. 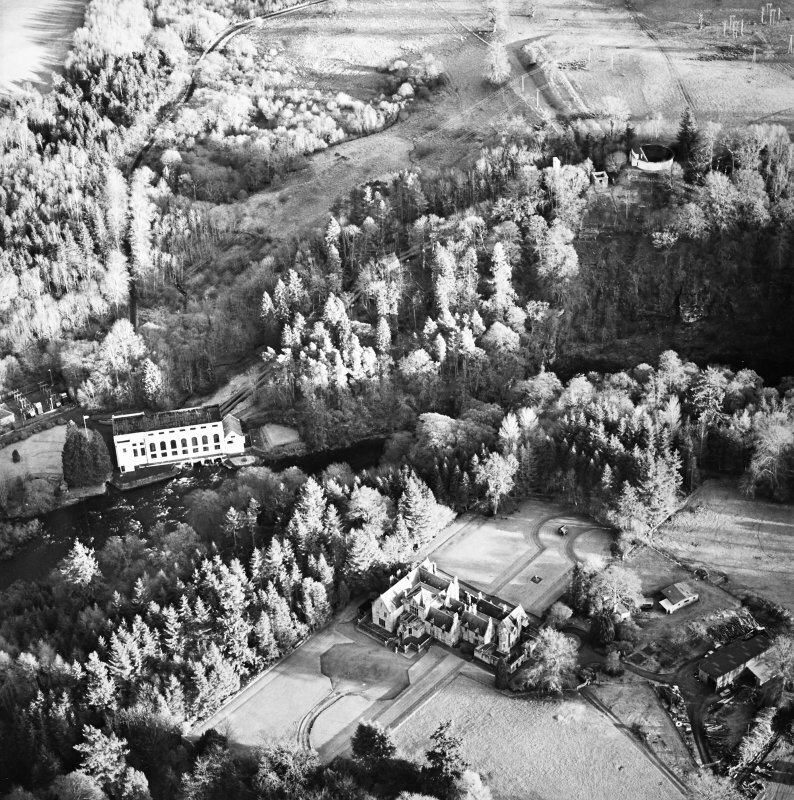 These can be seen clearly in an aerial photograph of 1946.